Atlantic City Diaries, Chapter 21: Atlantic City Boardwalk Con! 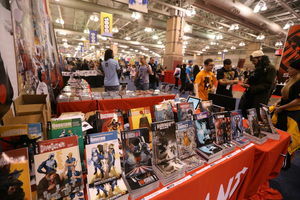 This past weekend, Atlantic City hosted its first comic book convention at the Atlantic City Convention Center. Dubbed “Boardwalk Con” (or ACBC, if you will), it was the jewel of South Jersey’s attempt to cash-in on geek culture. And, in terms of guests, it was pulling out all the stops. Stan Lee! William Shatner! Kevin Smith! Others To Be Announced! I am a long-time geek. Aside from gambling, drinking, Bruce Springsteen, and Nets basketball, comic books are my one true love. So, inspired by Atlantic City’s attempt at something new, I decided to shake up the diaries and try a new approach. I would be a) making it a day trip (there in the morning, back at night), b) go by myself, and c) almost completely not gamble. The results? About what you’d expect. 7:30AM – With the convention starting at 10:00AM, I wanted to get down early to maximize my hours at the show. So, I looked into the earliest bus from New York to Atlantic City. Now, the buses to leave Atlantic City generally run at all hours of the night. However, to go there? The earliest was 7:30AM (the last bus of the day is at 11:30PM). I would think that buses would start rolling around 6:00AM – how else can you catch the breakfast buffet? The bus was packed with an array of the usual degenerate gamblers and the unusual comic nerds. Yes, there were people in strange make-up carrying lightsabers onto the Atlantic City bus, something I’m sure made the bus regulars wonder if they were in the midst of a stroke. Towards the end of the trip down, many of the regulars were shouting at the bus driver to go faster. Clearly, the gamblers had had enough of the nerd talk that dominated the ride. 10:30 – First stop, the AC bus terminal. Many of the nerds shuffle off at this stop. However, I cannot suppress my gambling side, and remain on the bus until it reaches Caesar’s. I turn my $25 bus voucher into a robust $14, and head over to the convention center. In the last diary, I bragged about how lucky OB and I were to get a cab. Unfortunately, I did not realize that the convention center is a 5-minute jaunt from Caesar’s. Take note, fellow readers (who will be going to the AC Beerfest next year because I told you do and seriously you should because it’s the best) – if your event is at the convention center, stay on the Boardwalk. Getting there, I was greeted by the all-too-familiar site at comic conventions: lines. There was a line to pick up your tickets from will call. Then once inside, there was a line to pick-up tickets to get autographs or see a panel (I had bought tickets for the Kevin Smith Q&A). Why you couldn’t get your admission tickets and your autograph tickets is beyond me, and is a complete screw up. I’ll forgive AC because this is their first year, but it is a problem they seriously need to address next year. The waiting time totaled over an hour but I am a comic con veteran, so I had built up the stamina for long waits like this. 1:00PM – The most disappointing moment of the day was finding out that Stan Lee had cancelled his appearance. While I hadn’t paid the exorbitant fee to get an autograph or picture with him, I was supposed to see him at the Kevin Smith Q&A. The man is 92 years old so I don’t know how many more times I’ll have this opportunity. It definitely put a sour note on the start of the convention. However, I was treated to a 3-hour session with Kevin Smith (with guest appearances by Michael Rooker and Jason Mewes). It was originally supposed to be just an hour, but due to it starting late and the lack of Stan Lee, they decided to move around other panels in the schedule and keep him there until 4:00PM. I know Kevin Smith has a ton of haters, and I’m not going to claim that all these haters are wrong. However, Smith has a very specific style that amuses a very specific audience, and I am definitely in that audience. His Q&A wasn’t very groundbreaking – I’ve heard many of his stories on previous episodes of his podcast, but it was the first time I had seen him in person, so I was proud to support the man. Plus, at conventions such as these, sometimes it is better to just sit and be entertained for 3 hours rather than meander aimless through a sea of people. 4:00 – However, I would be remiss if I didn’t get that meandering time at the show. As described on Dinodrac.com, this convention was the perfect size – not too crowded like San Diego or New York, but big enough to feel like a true event. I circled the show floor several times, taking in all the vendors, exhibits, artists, and what not. The thing I noticed was the large emphasis on cosplay. In my comic convention going heyday (roughly 2000-2004), cosplay was a novelty. Now, there are booths dedicated to cosplay “stars,” as well as vendors specializing in selling cosplay wares. Cosplay at comic conventions is a phenomenon I’m proud not to “get” – everybody needs something they can sound like a cranky old man when talking about. Towards the end of the day, I would walk through the hall, vowing it would be my last time, and then I would leave. This plan would go awry as I found a new booth that interested me. If I found this booth interesting, maybe I missed another interesting booth? So, one more trip around the hall, and THEN I’ll leave. But, yet again, I’d find another cool booth. You can see where this was going. It took me four or five “final walkthroughs” before I called it a day. 5:30 – I’m on the bus back home, thinking over my day. My final haul: three hours with Kevin Smith, a handful of free comics, two drawings from comic artists, seeing random celebrities and cosplayers, and $14. Not…. great. I don’t regret going to the ACBC, but it falls into a very strange category: an event that I feel I got my exact money’s worth. I don’t feel cheated, but I don’t feel that I got a great bang for my buck. Furthermore, it just felt strange to be going back on the AC bus within 8 hours of having ridden it down, completely sober and not having gambled. So, unlike the AC Beerfest, the ACBC is a “wait and see” proposition for 2016. My attendance next year will be dependent on several factors, but mainly I want to see what guests will be there. However, should I go, I will definitely want to make a weekend out of it. Not gambling in AC…. I feel so….. unclean.